Lent is one of the oldest most honored traditions of the Christian Church. It is the 40 day period before Easter when Jesus was preparing for the cross. Traditionally, the Church has used this time to remember Jesus preparation and sacrifice and prepare to celebrate his glorious resurrection. There was a time, centuries ago, when Lent was the time when all new believers prepared for baptism and to officially join the Church. Throughout the centuries the importance of Lent has changed among the various Christian traditions. Among Roman Catholics it’s a time to remember Christ’s preparation for the cross by denying themselves meat on Fridays and for many by fasting from a particular habit or luxury throughout the 40 day period. Some protestants use have special decor and vestments (sacred clothing worn by ministers during worship services) used to help focus worshippers on Jesus’ preparation. Others simply ignore Lent until Palm Sunday. We’ve decided to take part in Do Lent Generously an initiative launched by Stewardship, an organization in the UK. Our goal is to take this important season remembering Jesus’ preparation for the cross as a time to focus more intentionally on living missionally. We want to honor Jesus and what he did by living intentionally the way Jesus call us to live, experiencing and expressing his love. If you’d like to join us go to Do Lent Generously for more information and sign up to receive the daily emails. Then, contact us so we can pray for and encourage you during Lent. You will also be among the first to find out about the special generosity event and have the opportunity to join in. Have a blessed and generous Lent. A few months ago, I sent a message to many of my Facebook friends asking them, to share one question they would like a pastor to answer about faith or Jesus. I received several great responses. Over the next several weeks I’m going to attempt to answer those questions. I will be as honest and thorough as I can. Due to the fact, however, that this is a blog, I’m going to be brief. I want this to be as readable as possible. I will have to leave a lot out. The advantage to this being a blog, though, is that you can interact with this right here. If you want to engage more regarding any of these questions, please jump in. I’d love to talk to you. Also if you have a question you’d like me to address, post it here or contact me through this website. With that said let’s dive in. One of the most intriguing questions I was asked had to do with why Christians don’t seem to respect the faith choices of others. It made me very sad to read the stories of rejection experienced from people calling themselves Christ-followers. That is completely antithetical to the teachings and actions of Jesus. Choice is one of the greatest gifts God gave us. It’s central to the story of the Bible and God’s relationship with us. At the very beginning God created humans. God provided everything they needed. He put them in a lush garden that provided all the food they needed. He created two people so that they would have companionship. He gave them meaningful work so that they would have a sense of purpose in life. At that time, in that environment, people had an amazing connection with God. The Bible describes it as that they walked with God in the cool of the day. I love that imagery. It reminds me of the walks my wife and I used to take in the evening when our daughter was a baby; or walking with my daughter to and from school through the woods, now that she’s older. At those times we have the most amazing conversations. That’s what it was like for the first humans with God. Now back to choice. Those first humans were given the amazing gift of choice. Most importantly, they had the choice to maintain that relationship with God or to go their own way. Essentially the choice was to let God be their god or choose to make themselves god. This choice was symbolized by a tree in the center of the garden. It was called the Tree of the Knowledge of Good and Evil (different, by the way, from a Tree of Knowledge which is not found anywhere in the Bible; all due respect to Steve Jobs). The only prohibition God placed on the first humans was not to eat the fruit from that tree. They chose to disobey God. There’s a lot more to the story. But, the result is the same. They used the gift God gave them to choose and they chose themselves over God. One of the lessons of this story is that while the gift of choice is good, not all choices are good. And let’s face it, ever since then the human race has had a propensity to make bad choices haven’t we? The result of that first bad choice was disconnection. The Bible says that the choice to disobey God caused us to be disconnected from God, from the earth, and each other. The results of that choice were devastating. I don’t think we fully appreciate the effects of that choice because we never experienced the world before that choice. Anyway, here’s where the Christian perspective on choice comes in. Orthodox Christianity teaches us that God was distraught about the position in which we found ourselves. God loves us and wants a relationship with us like he had with the first people. But ever since then, we’ve rejected him in favor of ourselves. This is where Jesus comes in. God sent Jesus to restore the relationships that were broken because of that first choice. Jesus came to teach us how to live lives where our relationships with God, the earth, and each other are restored. Then he willingly died on our behalf restoring those relationships and his resurrection is the evidence that he accomplished what he came to do. Now for a moment, suppose the biblical story is true. Suppose that God really created people. Suppose God loves us and desperately wants a relationship with us. Suppose that the bad choices we make prevent that and all of our relationships. Suppose that Jesus came, lived, died, and rose again to restore those relationships. Suppose that following Jesus with your whole life would allow you to experience those restored relationships. Wouldn’t that be pretty cool? If that were true, wouldn’t you want to experience that? If that were true, wouldn’t you want everyone you know and love to experience that? Those of us who call ourselves Christians, Christ-followers, Jesus-freaks, or whatever other Facebook moniker is in vogue today believe that this whole story is true. Speaking for myself; I’ve experienced it. I believe with all that I am that this story is true. Because I’ve experienced this, I want everyone to experience it. I think following Jesus (or choosing not to) is the most important choice in life. Now back to the misguided judgmental Christians that prompted these questions and indirectly this blog post. It is wrong to look down on other people because they don’t choose to follow Jesus. It is wrong to look down on other people because the choose to follow Jesus differently. It is wrong to look down on people because of the choices they make. It’s even wrong to look down on people because they choose to be Buckeye fans. (That joke makes more sense if you live in Ann Arbor.) At the same time, it’s a very human act to look down on people who choose differently from us. We look down on people who choose different political parties than us. We look down on people who choose to drive different cars than us. We look down on people who support different sports teams than us. We look down on people who make different faith choices than us. It’s not OK. It’s not right. But it is true. It is also very human to overcome our human limitations. I think that’s why I like the Olympics so much. I get to see people overcoming human limitations to do something extraordinary. Oscar Pistroius from South Africa is a perfect example of this. A double amputee overcame not just physical limitations but cultural limitations of bigotry and mistrust and ran in the Olympics. He is one of my heroes. In a less spectacular way there are Christians overcoming our human limitations and learning not to look down on people who choose differently than us. Agape Ann Arbor is a community of people trying to do that. We are a group of people that are trying to truly live the way that Jesus lives and love the way that Jesus loves. As I close this incredibly long-winded post, I’d like to say one more thing. Remember, Christians believe that choosing to follow Jesus is the best choice anyone can make. While many people do a poor job communicating this out, encouraging someone to follow Jesus is truly an act of love. If you believed Christianity were true, wouldn’t you want other people to experience it too? I believe the story of Jesus is true. I believe that following Jesus is the best choice anyone can make. I would love for you to choose to follow Jesus. But ultimately, I respect your choice. I’m a big fan of C. S. Lewis. There’s nothing of his that I’ve read that I didn’t enjoy. My six year old daughter is developing a love for him as well. About six months ago I started reading her The Lion, the Witch and the Wardrobe. She was absolutely enchanted with the story. Since I’ve been reading her a chapter of Chronicles of Narnia almost every night before bed. As you may or may not know, Lewis wrote the Narnia stories as an allegory for the Christian faith. The other night my daughter and I were reading a chapter from The Silver Chair (Narnia). At a key moment in the book the lead characters, Eustace Scrubb and Jill Pole (from our world), Puddleglum the Narnian Marsh-Wiggle, and Prince Rilian of Narnia have been captured by an evil witch in underworld. They’ve been enchanted by her music. The witch is trying to convince them that the land on the surface, where they’re from, is only a dream. In their enchanted stupor the try to convince her of the truth of the overworld. They try to describe the sun to her. In so doing they use a lamp as an illustration. It’s like the lamp, only better. Then they try to describe the great Aslan to her. He’s like a cat, only better. Often, I feel like Eustace, Jill, Puddleglum, and Rilian when I try to explain to people about my life with Jesus. It’s like ordinary life, only better. But like the witch, why should someone believe me if the only way I can describe following Jesus is by saying it’s like that only better. Who can blame people for reacting like the witch and saying what a lovely dream that must have been. Ultimately, Eustace, Jill, Puddleglum, and Rilian would rather hold on to their dream than submit to the dull “reality” of the witch. Once they’ve committed to this they are able to defeat the witch and are vindicated when they return to the surface. It reminds me of Pascal’s wager. Pascal, the French philosopher, mathematician, and Christ-follower, argued that following Christ is a simple choice. In Pensees he argued that it only makes logical sense to follow Jesus whether it’s true or not. He said if you follow Jesus, you have the potential to gain everything but no matter what you lose nothing. If you don’t follow Jesus, you have the potential to lose everything but no matter what you gain nothing. How about you? How would you respond to Pascal’s wager? Let me say that again to be perfectly clear. I don’t hate church. I’m a missionary and a church planter. God called me twelve years ago to vocational ministry. God called me to work in and for the church. My current endeavor is launching a new church community called Agape Ann Arbor. As a missionary and church planter, I spend a lot of time talking to people about Agape Ann Arbor. The more I share our vision and our story the more confused I am by the reactions I receive. Here is a brief summary of what I typically share with someone interested in learning more about us. If you’d like to know more you can check out our Open Letter to Ann Arbor, Introduction to Agape Ann Arbor, and blog. Agape Ann Arbor is a different kind of church community. Our vision is to be a community experiencing and expressing God’s love. The typical church in America is built around the weekend worship service, focusing on musical corporate worship and preaching. We’re building Agape Ann Arbor around relationships where people can experience and express God’s love with each other. The typical church plant launches with a Sunday morning worship service. We’re launching with parties and conversation groups where people connect and share relationally. Virtually everyone with whom I’ve shared this vision has responded incredibly positively to the idea. Here’s what I don’t understand, why aren’t more people doing this? I’ve not met a single person trying something similar in the US. It’s almost an unspoken rule that if you don’t have a traditional Sunday morning worship service you’re not a church. I feel like many of us have made an idol out of the Sunday morning worship service. I feel like we value singing and preaching more than we value Loving each other just as Jesus loved his disciples. What do you think? Is this a fair assessment? What am I missing? If you are a part of a church, why? Here’s my root problem with that statement. It reeks of consumerism. At it’s core, that statement is saying that church is about what I get out of it and if I’m not getting what I want, I’ll go somewhere else. After all, what am I getting for the money I give? Here’s the reality. Church isn’t about you. If you leave, the church will still be the church. If you stop giving the church is still going to be the church. God owns the cattle on a thousand hills (Psalm 50:10). So I’ll ask again, why are you a part of a church? This is an area where I think my Catholic brothers and sisters are moving in the right direction. A church worship service is not about the people sitting in the pews. It’s about God. Catholics attend mass to meet God. Specifically, they believe they meet God in the eucharist. This isn’t the place where I want to debate the theology of the eucharist. It’s not important for this post. What is important is that Catholics attend mass to meet God not to learn interesting factoids about the Bible. This should be true of all Christians. We should all attend worship services with the goal of meeting God. After all what are we worshipping? Finally, why are you a part of a church? Is it about you or about God? I have a confession to make. I’m kind of a conference junkie. As a missionary and church planter in Ann Arbor, MI it hard to find the time to connect with other missionaries and church planters to learn from and build relationships with. It’s also hard for me to create space to sit back and experience corporate worship and teaching, which all Christians need. That’s why I like conferences. This year we will be discussing how themes such as Gospel, Kingdom, and Scripture interact in a pluralistic culture where Christianity once was but no longer is the dominant framing story of culture. The theme is incredibly relevant to me and the ministry we are doing through Agape Ann Arbor. Two of my favorite authors and long-distance mentors Scot McKnight and Dallas Willard are speaking. Another long-distance mentor and someone I’m developing great respect for is speaking, David Fitch. This conference is intentionally diverse in denomination and theology. I expect to connect with other missionaries and church planters. I could give you other details like the cost, the schedule, the accessibility of the venue, etc. But you can go to the website for that. Here’s what you need to know. If you’re a missionary, church planter, or ministry leader in America looking to engage with American culture in a way that honors Jesus and pushes forward the influence of his kingdom, you need to be at The Future of the Gospel: A Missio Alliance Gathering. So, stop asking questions. Stop thinking about it. Go to the website and register. I heard a really interesting interview on NPR this weekend. In their money segment on Sunday mornings they’re running a series on faith and money. This weekend they talked to a young Jewish couple who run a kosher food truck in LA and their Rabbi. What stood out to me was the practical ways in which the young couple being interviewed applied their religious principles to their lives. These principles, by the way, are the same principles that Christ-followers should apply as well. We are all reading the same book after all. A comment they made early in the interview was that as practicing Jews it was easy for them to determine what to buy at the grocery. Yet, it wasn’t so easy at Best Buy. That struck me as kind of funny. I had never thought about whether a TV could be kosher or not. I’m still not sure if it can, but that’s not the point. The point is that for them shopping involves intentionality. Shopping is and exercise in mindfulness. That’s the first lesson I drew from the interview. Are you mindful when you shop? Do you consider the full implications of the purchase you’re making? Do you consider how this purchase affects other people? I wish I could say I do. But I don’t. You see, it’s not just about getting the best deal on the product you want to enhance your life. Every purchase we make is a moral choice. There was a second point that they made. It has to do with the value of the service provided by the people selling the product. The young woman talked about making a shoe purchase. Very stereotypical I know, but it’s true. Anyway, virtually any shoe you can find in a shoe store can be found online. If getting the best price on a pair of shoes were the only goal, then it would make sense to buy shoes online. Yet, shoes are very personal. You have to try them on before you buy them. There’s a simple solution of course. Go to the shoe store. Find the shoes you like. Try them on. Then go home and shop online to get the best deal. Yet, what does that strategy communicate about the value of the person trying to sell you the shoes in the store? Do you see how dehumanizing that strategy is? You would be making that person work for free (shoe salespeople generally work on commission). That strategy communicates that the service of the salesperson is of know value. That strategy, moreover, violates God’s principles of caring for people. The service that people provides has value and they should be paid appropriately. Every dollar we spend communicates something about the person we are and the person we are becoming. We need to shop intentionally and, to the best of our ability, spend our money in the most morally responsible way. We also must remember that every person is valuable and they deserve to be compensated for the work that they do. These two principles should affect how we spend money every day. Do you have any stories of how you have shopped mindfully or made a point to value the work that someone has done for you? This is one of those books that I’ve been meaning to read for a long time. I first heard about it when it came out in 2007. I wish I had read it then. It would have helped me a lot in the process of developing the vision for Agape Ann Arbor. The book is well written. Dan’s style is easy to follow and the stories he chose are both compelling and relevant. Overall, I like the format too. He broke the book down into three sections. The first section sets the context of the book by describing the culture and lifestyle of young adults in the 21st century. Section two focuses on specific views that young adults have of the Christian church. The final section offers advice to churches and Christians based on what Dan has learned over his many years of ministry. The first section does a very good job describing the situation of a young adult in the 21st century. It describes well the cultural phenomena that have shaped this generation and the behaviors that this generation has developed. The one thing that I struggled with in this section is the overall tone. I’m well aware of the statistics that highlight that phenomenal lack of church participation among the 20 – 35 age group. What I remain unconvinced of is the uniqueness of this phenomenon to this generation. It’s become commonplace to bemoan the lack of religiosity among the younger generation. The builders did regarding the boomers. The boomers did regarding GenX. Now the boomers and GenX do regarding the millennial generation. Yet, I haven’t been presented with evidence that religiosity among the 35 – 50 age group is dramatically less than that group was 10 or 20 years ago. In other words, people have and keep coming back to church. With that said, I don’t think we should dismiss what Dan and other authors are saying about young adults. Young adults have and will always react to their parents culture. The flappers did in the 20s. The boomers did in the 60s. What we’re experiencing now is the second verse same as the first. Yet with every verse, we have to learn. We have to learn new ways to reach the people who are responding negatively to the way things are today. That is where this book and the others like it are so important. The phenomenon we’re experiencing isn’t anything new, but we still have to respond to it and do something about it. If we don’t we may experience something new. This group of young adults may not follow the normal pattern and return to the church. Moreover, every person that has ever lived is important to God and as Christ-followers it is our job to point them to his love. With every generation we need to learn to speak a new language that will point them to God’s love. That’s where the second and third sections of Dan’s book are so important. His experience has been confirmed by a great deal of research and my own anecdotal experience. If you take the time to read the book, I bet your experience will confirm it too. Section two puts words to what we’re experiencing. Dan makes it concrete so we can address it. He provides the opportunity for all of us to open our eyes and understand “these kids” so we can communicate God’s love to them. Finally, he provides some advice on what to do about it. 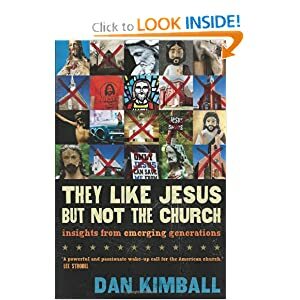 I highly recommend Dan Kimball’s They Love Jesus but not the Church. Anyone who seriously wants to see God’s kingdom come and his will be done on earth as it is in heaven needs to read this book and consider seriously what they are going to do about what they learn. You did first what we shall do. and gave me a firm place to stand. a hymn of praise to our God. and put their trust in him. to those who turn aside to false gods. the things you planned for us. Through his death came life anew.